The secret? Top it with a hefty salad. Avocado toast has become an Instagram cliché. While it makes a great breakfast, all you need to turn it into dinner are some vegetables and protein. 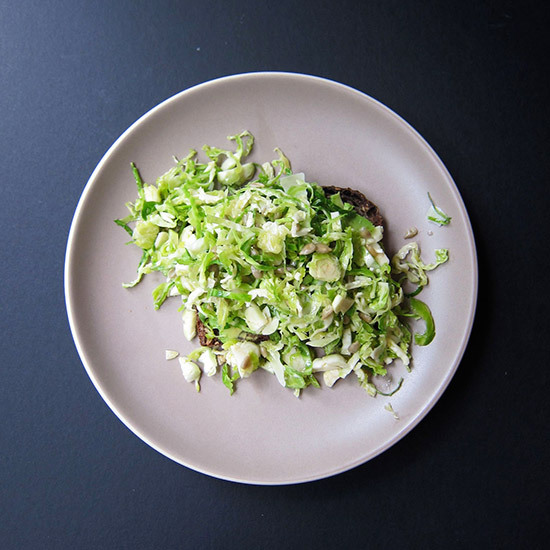 Here, the toast gets smothered in a hefty brussels sprouts salad. For the most nutritional value, use dense, seedy bread. An easy-drinking sparkling wine, like cava, is a fun choice for these toasts. It makes them feel extra festive. 1. In a large bowl, combine the brussels sprouts with ½ teaspoon of salt; toss, massaging the sprouts lightly. Add the sunflower seeds, lemon juice, olive oil and pecorino and let stand for 5 minutes. Season again with salt if necessary. 2. Arrange half of the avocado on each slice of bread. Mound the brussels sprouts salad on top, and serve with a fork and knife. One serving 443 cal, 27 gm fat, 3 gm sat fat, 50 gm carb, 16 gm fiber, 9 gm protein. Wine Easy-drinking cava, such as NV Bujonis Reserva Brut.